Poor Bruce! This is not the first time our practice cat has featured in this newsletter. 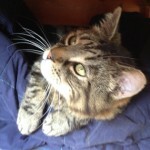 At present Bruce is suffering from pancreatitis and is in our hospital. Pancreatitis in cats has two forms, acute and chronic, which are usually diagnosed by symptoms and by ruling out other diseases. There are diagnostic tests for pancreatitis, but they are not always accurate, they can be costly, and can be quite invasive for a definitive diagnosis. Pancreatitis can also predispose your cat to other disease processes. The pancreas is an organ that makes two primary products – digestive enzymes and insulin. Normally the digestive enzymes are released in an inactive form and are not activated until they reach the intestinal tract. This is to prevent the enzymes that are designed to break down food from coming into contact with the delicate pancreatic tissue. In pancreatitis, for reasons yet unknown to us, these digestive enzymes will become activated while they are still in the pancreas. This results in significant inflammation and irritation to the pancreatic tissue, which can also cascade to other surrounding tissues such as the liver and intestinal tract. This can lead to secondary bacterial infections in the pancreas. If the activation of the digestive enzymes is significant enough, then your cat can develop acute pancreatitis which can range from mild to severe and life threatening. If the activation of the digestive enzymes remains mild and continues long term, then your cat may develop chronic pancreatitis, which can result in the development of scar tissue in the pancreas, and eventually pancreatic insufficiency and predisposition to diabetes. It has been estimated that 30% or more of cats have chronic pancreatitis, but many may never show symptoms. Symptoms - Every cat will have different symptoms, some may have several, and some may have only one. Intense vomiting: Your cat may vomit multiple times over a period of hours or days, and may not be able to keep food down. This needs to be addressed quickly to prevent dehydration. Pain: Your cat may be sitting in a hunched position with their head tucked, or not want to be picked up or touched. Acute pancreatitis is very painful in all mammals. Anorexia:Your cat may be feeling intensely nauseous and painful, so it is unlikely that they will want to eat. Lethargy: Your cat may be extremely tired and lethargic. Diarrhoea: If your cat’s pancreas is so inflamed that it is not secreting digestive enzymes into the small intestine, then any food that your cat does eat may come out as diarrhoea with a very foul odour. Diagnosis - With acute pancreatitis, we will need to begin treatment immediately. How we treat at this point will be based on the severity of the symptoms and blood sample results. Blood tests: As well as general haematology and biochemistry tests there are pancreas specific tests such as fPLI – this stands for feline pancreatic lipase immunoreactivity which can be elevated in pancreatitis in cats. However, while a positive test can confirm a diagnosis of pancreatitis, a negative test does NOT rule it out. It is possible to have a false positive with this test. The accuracy of this test has been estimated to be between 50-80%. So, while we may use this test to try and confirm a diagnosis of pancreatitis, we will not use it to make an initial diagnosis. Ultrasound: For an experienced ultrasonographer, this can be a good way to diagnose pancreatitis, by finding an enlarged, thickened pancreas on ultrasound. However, this requires a more advanced skill level of ultrasonagraphy than most general practitioners have. Biopsy: This is considered the gold standard for a 99.9% accurate diagnosis. However, this requires exploratory abdominal surgery which is invasive to your already sick cat, and it can take 2-3 days to get the histopathology results, so we do not do this routinely. Treatment - The goal of treatment for acute pancreatitis is to reduce your cat’s pain and nausea, stabilize any electrolyte abnormalities, treat any secondary infections, and reduce the inflammation until your cat is able to heal. Pain management: This is one of the most important aspects of treating acute pancreatitis. Commonly used drugs are: Buprenorphine. This is a narcotic that has show to have excellent pain control in cats. This is our most common first line pain management for acute pancreatitis. Nausea: We have several anti-nausea medications that we will use in cats with acute pancreatitis. Most commonly used is Cerenia (maropitant). This is a fairly new drug that has quickly become our first line of defense for nausea in cats. This drug not only reduces nausea and vomiting, but it also has anti-inflammatory and anti-pain properties. Reducing gastric acid secretion in the stomach can help an already nauseated cat. We often use omeprazole. Antibiotics: We may use antibiotics to treat any secondary infections. Intravenous fluids: If your cat is having a hard time staying hydrated due to vomiting or not drinking, or if your cat has abnormal electrolytes, then we will start intravenous fluid therapy. Syringe feeding: If is very important that you cat eats. If they are too nauseous to eat, we may syringe feed them a very bland diet or a prescription diet. Scar tissue: After the inflammation subsides, there is a chance of scar tissue developing in the healing process. As long as there is enough healthy tissue remaining, then your cat may never have any additional problems. Chronic pancreatitis: This is what happens when your cat’s pancreas continues to have low grade chronic inflammation. This can result in regular vomiting and anorexia episodes. Pancreatic insufficiency: When too much of your cat’s pancreas that makes digestive enzymes is destroyed, either by severe acute pancreatitis, or by chronic pancreatitis, eventually the pancreas will not be able to make enough enzymes to digest food. Your cat may then have large fluffy diarrhea and an increase in vomiting. This can be treated by giving your cat synthetic digestive enzymes. Type I diabetes: When enough of your cat’s pancreas that makes insulin is destroyed, it will not be able to make enough insulin to counteract the glucose in the body. Your cat may then develop diabetes and will need to be started on insulin injections. The symptoms of chronic pancreatitis are very similar to acute pancreatitis, but on a milder scale. A common pattern we will hear is that your cat will vomit several times a day for a few days, not want to eat, and may act uncomfortable and lethargic, and then a few days later, will be fine until the next episode. These symptoms can also be similar to inflammatory bowel disease, so we may ask you lots of questions about exactly what goes on with each episode, and frequency to try and distinguish between the two. Diagnosis again is similar to acute pancreatitis, but it can be harder as the blood work will be more likely to look normal, fPLI will only be positive if there is significant inflammation, and ultrasound will be even harder to detect. There is a blood test available that will test for two pancreatic enzymes and two intestinal enzymes to try and differentiate between pancreatitis and inflammatory bowel disease, but if it is negative, it still doesn’t rule either one out for sure. Treatment most commonly is symptomatic, with pain medications, antibiotics, and anti-nausea medications. For cats who do have routine flare ups of chronic pancreatitis, we may want to treat long term with Cerenia as a preventative. We have a few other preventative treatment options as well if Cerenia is not an option. While pancreatitis is one of the more painful and potentially nauseating diseases we can see in cats, as you have just read above there are things we can do to decrease its effects and help your cat to feel better. Corneal ulcers are defects of the ‘cornea’, the clear ‘window’ of the eye. The cornea is a very special tissue that is completely transparent. In contrast to the skin, it lacks pigment and even blood vessels to maintain its transparency. The cornea is very rich with nerves, making it a very sensitive tissue. This is the reason why even small particles such as dust on the surface of the eye can be so uncomfortable. All three layers are important for the cornea to work. The outer layer or ‘epithelium’ can be thought of as a layer of cling film that forms the surface of the cornea and protects it from infections. It works as a shield to the eye. The thick middle layer or ‘stroma’ is what gives the cornea its strength and stability. Corneal ulcers are classified by the depth, depending on the layers they affect. If only the epithelium is missing this is classified as a ‘superficial ulcer’ or surface defect only. If the ulcer reaches into the stroma it is classified as a ‘deep ulcer’. While superficial or surface ulcers are uncomfortable and present a risk of infection to the eye; the eye is not at risk of bursting unless additional problems occur. However when the ulcer gets deep the eye becomes weak and can even perforate. Deep ulcers lead to visible indentations on the surface of the eye and can be accompanied by inflammation inside the eye. Signs of corneal ulcers usually include eye pain (squinting, tearing, depressed behaviour) and ocular discharge, which can be watery or purulent. Sometimes a lesion may already be visible on the surface of the eye. In this case it is particularly important to seek help from your veterinary surgeon as soon as possible. 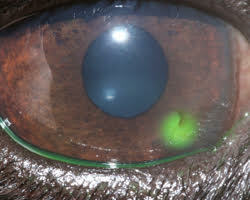 To diagnose a corneal ulcer your vet may use a special dye that highlights any defects of the surface layer by staining the underlying tissue green (see the image at the start of this article). This test is called the fluorescein test. Why do corneal ulcers occur? When the presence of an ulcer has been confirmed, it is important to try and find a reason for it. Most ulcers occur due to an initial trauma. This is more likely to happen in dogs and cats with very prominent eyes (also called ‘brachycephalic’ animals), for example in Pugs and Pekingese dogs or Persian cats. In cats the flare up of a Feline Herpes Virus infection is also a common cause for the development of a corneal ulcer. Many conditions can increase the risk of corneal ulcers. Reduced tear production is a common contributing factor, but other conditions such as an incomplete blink, in-rolling of the eyelid (also called ‘entropion’) or eye lid tumours may contribute to the occurrence, but even more so may interfere with the healing process. To treat an ulcer it is essential that the underlying cause is identified and if possible corrected. This will stop the ulcer from getting worse and allow the eye to heal as quickly as possible. The treatment plan will usually include eye drops to treat or prevent infection but may include other medication depending on the cause and severity of the ulcer. Painkillers and/or antibiotics by mouth may also be necessary. Do any corneal ulcers require an operation? If an ulcer is deep or the cornea is even ruptured, surgery is required to save the eye. Different techniques are available, but all of them place healthy tissue into the defect to stabilise the cornea. Very small suture material, as thin as a human hair, is used to repair the cornea and an operating microscope should be used to handle the small and very fine structures of the eye. In most patients the healthy tissue is taken from the same eye from an area adjacent to the corneal ulcer. The pink tissue next to the cornea (the conjunctiva) can be used for that to place a ‘conjunctival pedicle graft’ into the defect. More commonly, healthy corneal tissue attached to conjunctiva is used as it provides more strength to the wall of the eye. This is called a ‘corneoconjunctival transposition’ (Figure 5). Corneal grafts are also possible but rely on the often limited availability of donor corneal tissue. Grafting surgeries are very successful in saving eyes, but can lead to scaring of the cornea leaving it less transparent in areas. How can corneal ulcers be prevented? Particularly in patients with prominent eyes, regular eye examinations should be performed to detect weaknesses in the corneal health. Indications of that may include white or brown marks on the surface of an otherwise comfortable eye or sticky discharge that continues to recur. Any painful eye should be presented to a veterinary surgeon as soon as possible. Eyes may be cleaned with tap water that ideally should be boiled and cooled down again, using a lint-free towel. This should however not replace or delay the visit to a veterinary surgeon, as many ulcers require medication to achieve fast healing and prevent ill effects to the transparency of the cornea and therefore the sight of the dog or cat. Particularly; if a deep indentation or bulging tissue is noted on the surface, the eye should not be manipulated to prevent any additional damage. Corneal ulcers are best prevented but if they are present they should be treated as soon as possible to stop them from getting bigger and deeper.